[92 Pages Report] Driven by the factors such as reducing IT staffing costs and workload, benefits offered by PCs as a service over traditional PCs, and increasing adoption of PCs as a service by small and midsized enterprises (SMEs), the PC as a service market is likely to witness a high growth in the coming years. This market is expected to reach USD 129.82 Billion by 2023 from USD 5.70 Billion in 2017, at a CAGR of 62.5% between 2018 and 2023. The base year considered for the study is 2017, and the forecast period is between 2018 and 2023. The objective of the report is to provide a detailed analysis of the PC as a service market based on deployment, offering, vertical, and geography. The report also studies the major factors influencing the growth of the PC as a service market. The research methodology used to estimate and forecast the PC as a service market begins with obtaining data through secondary research from secondary sources such as such as journal, newsletters, and whitepapers of the leading players in the market. The bottom-up procedure has been employed to arrive at the overall size of the PC as a service market from the revenues of key players. After arriving at the overall market size, the total market has been split into several segments and subsegments, which have been verified through primary research by conducting extensive interviews with officials, such as CEOs, VPs, directors, and executives, holding key positions in the industry. The market breakdown and data triangulation procedures have been employed to complete the overall market engineering process and arrive at the exact statistics for all segments and subsegments. The breakdown of the profiles of primaries has been depicted in the following figure. The key players operating in the PC as a service market include HP (US), Dell (US), Lenovo (Hong Kong), Microsoft (US), HCL (India), AWS (US), StarHub (Singapore), and CompuCom (US). This study answers several questions for the stakeholders, primarily regarding the market segments to focus on in the next 2 to 5 years for prioritizing efforts and investments. This research report categorizes the overall PC as a service market based on deployment, offering, vertical, and geography. 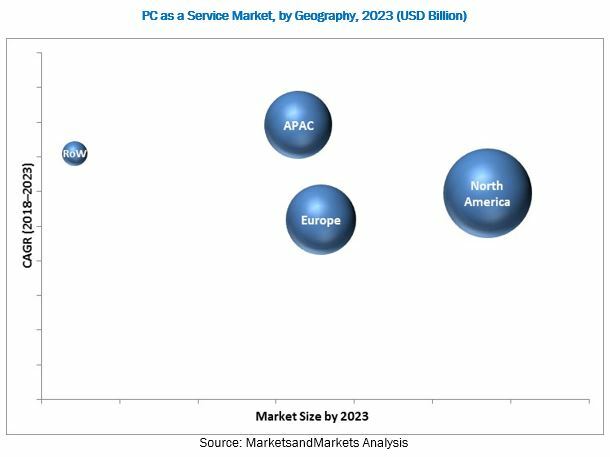 The PC as a service market is expected to reach USD 129.82 Billion by 2023 from USD 11.46 Billion in 2018, at a CAGR of 62.5% between 2018 and 2023. The major factors driving the growth of this market include reducing IT staffing costs and workload, benefits offered by PCs as a service over traditional PCs, and increasing adoption of PCs as a service by small and midsized enterprises (SMEs). PCaaS works on the OPEX model, which helps organizations in prioritizing their investments by leasing PCs and associated services instead of purchasing high-cost PCs. This, in turn, helps in minimizing the impact of technology obsolescence, reducing complexity, and increasing efficiency of the organizations. Due to these reasons, small and midsized enterprises as well as large enterprises are increasingly focusing on adopting PCs as a service. In this report, the PC as a service market has been segmented on the basis of deployment, offering, vertical, and geography. The IT & telecommunications vertical accounted for the largest share of the market in 2017. The adoption of PCaaS solutions in the IT industry is increasing. Enterprises are shifting PC procurement from CAPEX to OPEX to focus on their core competencies and increase their efficiency. Companies are increasingly adopting PCaaS solutions, which are outsourced by third-party vendors, to reduce their operational costs and increase their revenues. These solutions can be implemented without the need to hire more IT staff. Small and midsized enterprises accounted for a major share of the PC as a service market in 2017. The adoption of PCaaS-based solutions is high among small and midsized enterprises owing to the benefits these solutions offer such as increased productivity and low capital expenditure; this trend is expected to continue during the forecast period. On the basis of geography, the PC as a service market has been segmented into North America, Europe, Asia Pacific (APAC), and Rest of the World (RoW). North America accounted for the largest share of the overall PCaaS market in 2017. However, the market in APAC is expected to grow at the highest rate during the forecast period. Increased spending on enterprise IT applications and IT infrastructure by enterprises in developing countries in APAC is one of the key factors driving the growth of the PCaaS market in this region. Moreover, the expanding ecosystem of startups and SMEs in APAC is contributing to market growth. Currently, there is less information about PC as a service in the market; however, the situation is expected to improve in the coming years. Due to less information, users are unaware of the advantages, such as installation, PC security, helpdesk support, software licensing, and computer maintenance, of the PC as a service model. Therefore, they are less willing to adopt this service as a model. There has been a gradual information wave elucidating and educating end users, which is expected to gain momentum in the coming years, leading to an increase in the adoption of PCaaS solutions. The key players operating in the PC as a service market are HP (US), Dell (US), Lenovo (Hong Kong), Microsoft (US), HCL (India), AWS (US), StarHub (Singapore), and CompuCom (US).